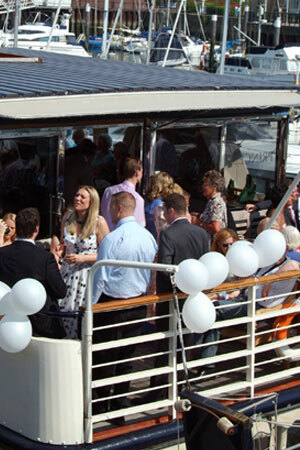 The Princess Caroline is certainly one of the the most engaging venues for a wedding reception in Lymington and the New Forest. It’s really quite unique and will make your wedding celebrations unforgettable, for both you, your family and all of your wedding guests. Lymington itself is a small but beautiful harbour town deep within the New Forest with a maritime history that goes back centuries, and is set in the heart of the coast of Southern England. The quaint harbour is set to a backdrop of cobbled streets and historic buildings which makes for some of the most charming and romantic scenery to set off your wedding celebrations. Lymington and the New Forest’s warm climate and sensational wildlife and scenery make it the perfect location for you to celebrate your wedding. You can cruise along the coast and into the harbour, taking in the stunning coastline whilst you and your guests dine and dance the night away. 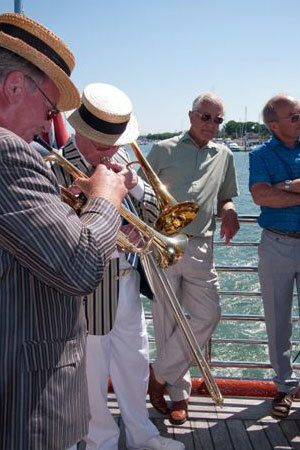 We can cater for small intimate parties or larger and grander celebrations. The Princess Caroline definitely has something to suit everybody, and all budgets, so book your wedding reception with us, and sail happily into the sunset and married life. Just imagine the stunning photos of you and your wedding guests taken with the flag billowing gently in the summer breeze, with the sailing boats and yachts, or the New Forest coastline in the background, all in contrast with the warm glow of the summer sunset. Your guests will dine like kings and queens in our stunning middle deck restaurant – with the perfect wedding breakfast banquet of your choice – which will be created by our award-winning chef and his team. Meanwhile, our highly trained serving staff will look after all of you and your guests’ every need. After your wedding feast, you and your guests can dance the night away under the stars on the Princess Caroline’s top deck with a gentle summer night breeze, to keep you cool. 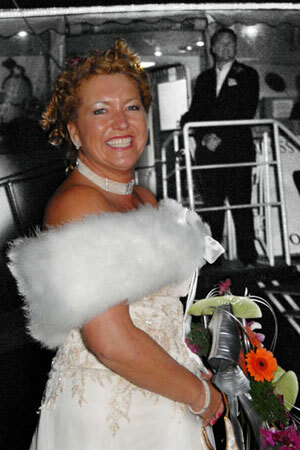 Holding a wedding reception on a boat is a little different to other wedding venues, and a lot more thrilling of course! As we’ve hosted many weddings in our time, we will take you through all the fine details you’ll need to understand about having your reception on board. We know how important it is to be organised and plan everything carefully so that you can enjoy your day to the full. We’ll go through every detail with you in advance and help you to choose the best menu, your cruise destination, and the order of events so that you have absolutely nothing to worry about on the day, and so that you can be sure it will be a huge success. Together we will make sure you and your guests have a truly memorable wedding reception. Celebrate your marriage on board the Princess Caroline, and embark from the beautiful harbour at Lymington, for an afternoon and or evening sailing with your family and guests. You can choose to sail to the Isle of Wight, or take a trip out of the estuary and along the coast. Weddings we’ve hosted in the pastWe will help you organise things so that you and your guests can travel to the harbour with the minimum of fuss, and can assist with parking arrangements if neccessary. We have access ramps and staff who will be able to help both children and senior friends and relatives to get on board and enjoy your day.